Christian Standhardinger scored a game-high 29 points, Garrett Nevels added 21 points and Brandon Spearman contributed 11 points tonight to help Hawai’i pull away from Norfolk State, 77-66, in non-conference men’s basketball action. A crowd of about 4,700 at the Stan Sheriff Center watched the Warriors improve to 10-3; the Spartans fell to 8-6. Norfolk State led, 28-27, after a close first half and 32-30 early in the second, but Nevels drained a deep 3-pointer to ignite a 9-0 run capped by Isaac Fotu’s free throw to give UH a 39-32 lead with 15:53 remaining in the game. The Warriors later stretched the lead to 64-50 on Spearman’s layup with 6:30 left, and the Spartans could not get closer than 74-66 on Malcom Hawkins’ 12-foot bank shot with 1:26 remaining. Standhardinger scored 18 of his points in the second half, and finished with seven rebounds. Nevels had eight boards. Keith Shamburger had six assists. Good win …number 62 career. .. Win and major step up on offense. and defense. Nice victory. Omaha going be a war! eagle….exactly what is BPI…RPI…pomeroy Rankings and how does it affect UH regular and postseason. .it gets confusing. .seem like UH only chance for NCAA dance is to win Big West tournament. .?or just a progress indicator.,? Great comeback win. Like New Mexico State , Missouri on the Road, the teams with athletic, length, pretty good athletes, can give UH trouble. That 7 footer was altering shots, and making it hard for Fotu. Good thing, UH has Nevels, and later Standhardinger and Spearman just kept on attacking in second half. I guess, that is how UH will have to win on road agains Irvine, Long Beach, Santa Barbara, just out hustle, and turnover, teams that might have more athleticism, or have the tall posts and perimeter players. Well, it is the best 5 on 5, and help from the bench. This team is pretty good. The best in nearly 10 years. Hope they can get Omaha. That team is 10-4, and very good. Come on out to the Stan Sheriff Center, at least 5000, should be a great game! And yes, as hoops says, congratulations to Gib for career win number 62 and mounting! winbow, they were doubling Fotu in the post, and the shot blocker was coming over and trying to deny and protect the rim. 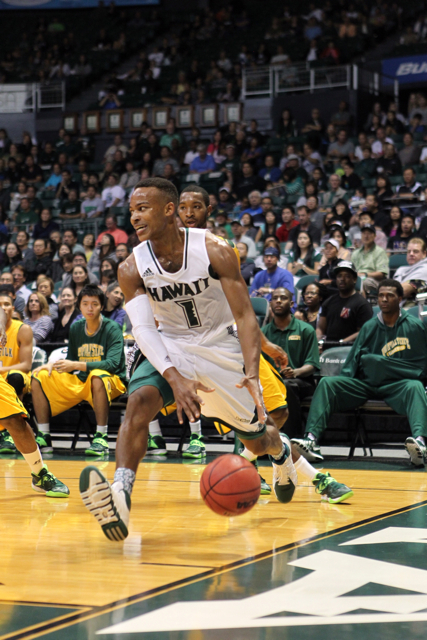 Good test, when UH goes agains those, LBSU, Irvine, UCSB teams with athletes who can get steals and block shots. When Isaac is isolated, against even taller opponent, he has great footwork and counter moves, can still bet shots off. That double, that is how BW teams will play him. As winbow, says, good thing this team, has more weapons, Christian, Nevels, Spearman, energy in Q coming off the bench. Still would like to see Jawato get up to speed, and help on D, and get his 3 ball going down, they can use him, on the road, in BWC . get well Jawato, we need your help too! Otherwise great win, and some more, video for team to look at, to see how they can attack switching defenses, and how Shamburger, has to protect ball from the lengthy athletic, guards who pick his pocket, Shamburger pretty smart PG, he will protect ball more, he values it, and will try not to have 5 turnover game in BWC play. This Norfolk team , as everyone was saying, they are going to win the MEAC and go to NCAA’s, another quality team UH played. Now on to Omaha, who is a very good Mid West, like Western Michigan, team, played some good opponents, and got some good wins! winbows1, RPI is a measure of your wins and the strength of those wins. it factors your win loss record, modified by a factor based on your opponent’s collective record and your opponent’s opponents record to form a strength of schedule modifier. it is the main thing the selection committee will use as a mathematical tool for both the NCAA tourney and the NIT. for us, it means little: we’ll still have to win the BWC tourney to get to the dance, but it’s a good progress indicator. Pomeroy is basically an enhanced version of RPI. it uses a similar formula, but it also factors in scoring margin, pace of the game ( as it can muddy scoring margin if not accounted for) and a deeper SOS formula. its basically a slightly more accurate RPI rating. BPI goes a step further, and accounts for all the things Pomeroy’s rankings account for, and also weights games differntly if a main player is out injured. this helped us a little because it gave a lower weight to the losses spearman did not play in and gave more value to the wins. Poweroy and BPI are not explicitly used by the selection committees for selection, but they MAY be depending on whether the individual voter decides to consider them. RPI, Pomeroy and BPI all end up the season fairly similarly. for us, its not super important, but is a good measuring stick of how ou rteam rates vs the rest of the country. Nice win tonight. Norfolk is a pretty good team with some good athletes, plus a gangly 7 footer. UH came out sluggish and Norfolk came to play in the first half. After halftime, UH put on the afterburners and got Norfolk way out of what they wanted to do. Looking at the play so far, I think Gib has his rotations pretty much set for BW play. All in all, I have to say Gib has stepped up his in-game coaching ability. He called TO and setup a very well executed last possession of the first half. Then he got the team to pick up the intensity big time after halftime, after a sluggish, sloppy first half. Also, Gib used put Smith and Shamburger on the court together and they really broke down Norfolk’s pressure defense very well. Timeout usage has been spot on for the most part. There have been more quality set plays off timeouts. So far, I’m quite happy with how Gib is running the program. It’s taken time to get to this point, but major rebuilding takes multiple years to complete. xer 21….Thank you. Very concise and clear explanation. I guess as eagle alludes to, comparing to last year and previous 3 years, of Gib’s tenure, this team is making progress among the 300+ NCAA D1 schools. This team has a ceiling, they just beat a very athletic team, that scouted them well, if they keep improving, and now, 8 out of 9 they have won, they go up in those rankings. Happy for Gib and this very hard working team, they stay together, and concerned about winning. They are going to shoot for NCAA’s , that is their goal. A regular season championship, first place, would assure that NIT spot. So , as others have stated, UH playing for Two goals, first, win the regular season title, and secondly, win the Big West Tournament. As Gary Dickman said on radio show, they want to be in the two post season dances that begin with the letter “N”, not “C”, right on. xer 21, and eagle thanks for the progress of UH men basketball team and program ranking, rundown, report. Gib has something special going. Team are believing they can beat anyone, and now, have to go out on the road, and think sweep. If they are going to reach goal hopefully of NCAA’s , that is what they have to do, think win every game. Should be good game this Friday. Omaha, very good team. Has anyone else noticed that coach Gib has been having bench nights lately? Bench nights? what do you mean? maybe warriorsofdawest means, Gib USING the bench more, Jawato, Valdes, Rozitis, Smith, and Thomas, 5 guys came in for PT, and even to give starters a rest, affected winning,. This Bench, they are really cheering on whomever on the court. Huge difference in team attitude demeanor from past. I don’t know xer 21, just guessing, warriorsofdawest , might have meant, USING MORE GUYS off the bench.? Number One thing , UH WON!! yeah, i just wasn’t sure, cause he just said Gib’s name, so i don;’t know if he’s referring to Gib himself, or the team that Gib is coaching.